Jan is proud to be old. She might fit AARP’s definition of an “elder” or “senior citizen,” but she is old and don’t try to call her anything else! More on that below. Creating Change is important for Jan because it’s really the only national organizing conference for activists. And Jan is quite an activist. She’s currently Co-Director of Old Lesbians Organizing for Change, an organization of lesbians over the age of 60 committed to confronting ageism and sharing their “great deal of wisdom, experience, and strength” with the world. We call ourselves OLD with pride. In doing so, we challenge the stereotypes directly. Thus, we empower and change ourselves, each other, and the world. At a workshop presented by SAGE about the new Movement Advancement Project study on LGBT Elders, an interesting discussion broke out because some members of OLOC in the workshop challenged their language. Jan is insistent that people need to understand ageism. She’s quite excited about the upcoming OLOC National Gathering, entitled “Old Lesbian Pride: Sharpening the Radical Edge.” She doesn’t like talking about “equality.” Radical change is about liberty, she told me. Liberation movements bring new values to justice. During the short time I had to speak with Jan, I got really fired up by her energy. I wish more young people had the same passion she had for moving this country forward. Bonus! Creating Change Conference Director Sue Hyde joined us for the photo! 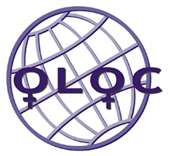 There are 2 Comments to "Faces For Equality: Jan Griesinger (OLOC)"